Games make up nearly a quarter of all applications available for the iPhone and iPod Touch, according to mobile analytics site Mobclix. The site shows that there are currently 6,165 games available in the App Store. Of those 1,485 are free and the rest are for purchase. 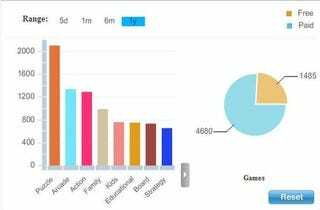 Mobclix also has an interesting breakdown of categories within iGames, with puzzle titles making up more than 23 percent of the mix, and arcade in a distant second with 13 percent of the titles. It is heartening to see that educational and kids games tie board and strategy in the mix.